Hi folks, Doc here. 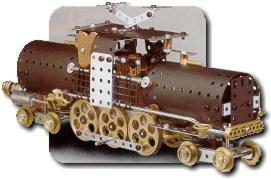 A constant feature of Erector sets throughout their many incarnations has been the locomotive model. 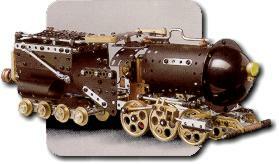 During the Classic Period of Gilbert Erector, a special set was devoted to the Hudson locomotive. Then, decades after Erector production by the A.C. Gilbert Company came to an end, a Hudson model resurfaced in a new size and form, and from a new manufacturer. The photo at right depicts the very latest locomotive model to bear the Erector® name, a highly stylized version of a 4-6-4 Hudson J3A. 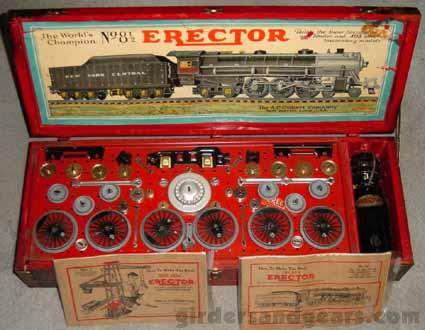 Produced by the Meccano® company in France in the early to mid 2000's, it was the feature model in the Erector Special Edition Train Set. 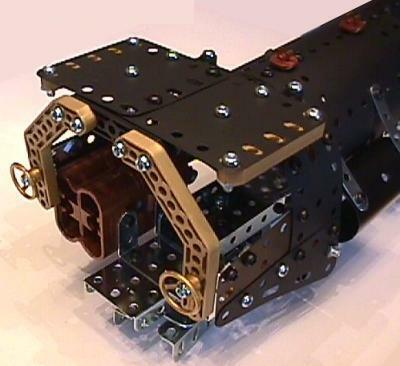 Measuring 16" long by 5½" wide by 5" tall and weighing in at about 3 pounds, the finished model is driven by a 6V battery-powered electric motor and runs on G-scale track. Before I show you the Special Edition Train set and locomotive model in detail, let's take a brief look back at its predecessors. 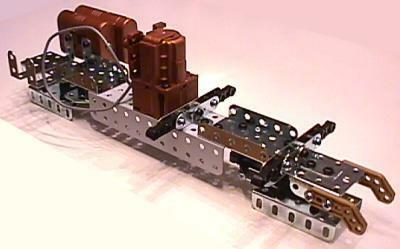 Trains have part of Erector almost from the beginning. The first train appeared in an Erector manual in 1915, the third year of production. Shown at right, it featured four cars, and it contained so many parts that no single Erector set was large enough to build it. You can see this model in more detail in Michael VanValkenburg's pictorial in my Model Gallery. The next train, a locomotive and tender, appeared in 1926, during the early part of the Erector Classic Period (1924-32). The recent introduction of the boiler and boiler top made this model slightly more realistic in appearance than the 1915 locomotive. Other railway models also appeared in manuals during this period, including a gondola and a caboose. 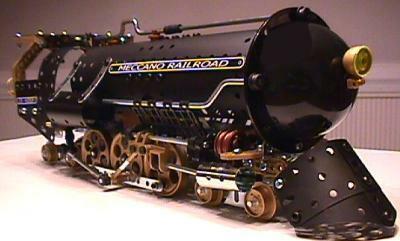 You can view the locomotive (see image above) and tender in more detail in my pictorial in the Model Gallery. 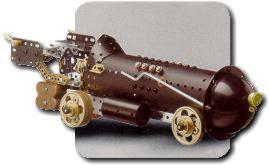 The single greatest expression of the Erector locomotive to appear during Gilbert Erector production was unquestionably the famous 4-6-4 Hudson. The model first appeared in 1928, during the height of the Classic Period, which was famous for Erector sets devoted to specific models. 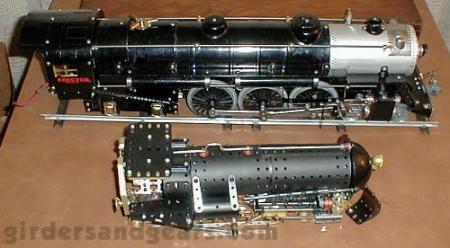 As the full-color illustration from the inside of the box lid shows (see below), the model represented a true departure for Gilbert in that this model (plus the tender that accompanied it in another set) was essentially an unpowered scale model, rather than just a "look-a-like" model built partly or mostly from generic parts in the standard Erector fashion. This was also a large, heavy model. 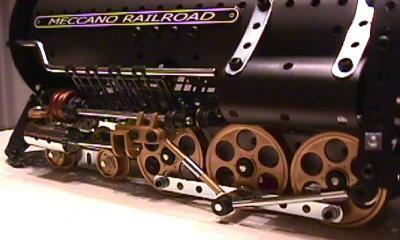 The all-metal locomotive itself is 29" long, 5½" wide, and 8" tall, and weighs nearly 9 lbs. The Classic Hudson set is a rare and sought after item today, in almost any condition, and commands very high prices on the collector's market. As mentioned above, the centerpiece of this set is an all new and quite different version of the Hudson locomotive. The set features many parts designed specifically for this model, which is reminiscient of the Classic Period of Gilbert Erector. 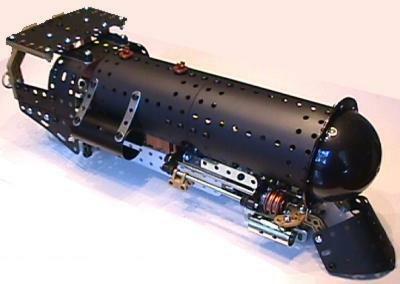 In addition, the set builds 6 other models, including two train models, an 0-6-0 locomotive and tender, and a 4-6-4 electric locomotive (see images at the end of this article), as well as a submarine, a rocket car, a rocket ship, and a vehicle that reminds this writer of an early Ford Model A. 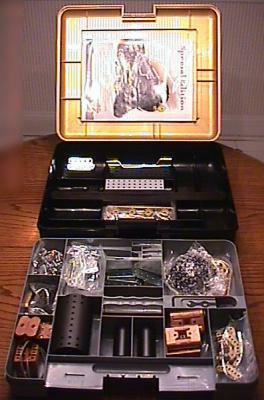 As the images on this page show, the designers at Meccano came up with a unique look for the model designs in this set, whose style seems both modern and retro at the same time. Some of them look like they would be right at home in a Jules Verne novel. I was also reminded of a vehicle that I had always thought was terribly cool, the "Hannibal 8" (shown at right). 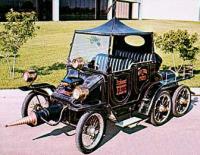 This was the car that Professor Fate - played by Jack Lemmon - drove in the film "The Great Race." 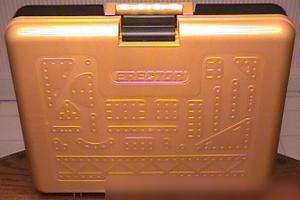 The set came packed in a sturdy gold and black plastic case that sports a folding handle and a secure snap latch. Inside, a gray compartmented parts tray supports most of the parts. Lifting it out by way of its molded-in handle reveals the remaining parts in the compartments molded into the bottom of the case iteslf. The manual is large and well illustrated. 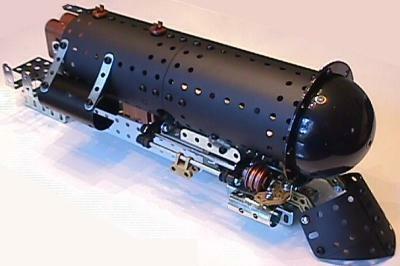 It contains pictures of all seven models, and detailed instructions for building five of them. 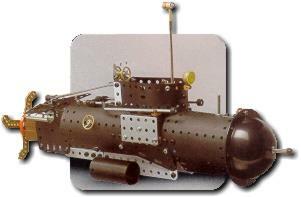 Assembly of the locomotive model was simple and fairly straightforward, thanks to the clear and detailed illustrations in the manual. I've documented the process in the photos below, focusing on the main stages of construction: frame, boiler, cab, wheels and running gear, and final details. 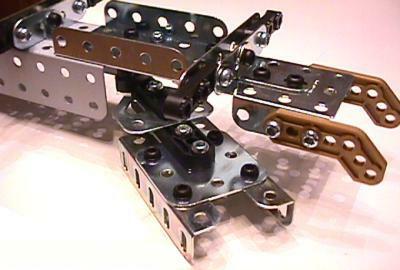 If you were not already aware of this, the new Erector sets from Meccano/Brio, including this one, contain a significant number of plastic parts in addition to the traditional metal ones, which are either painted or plated. 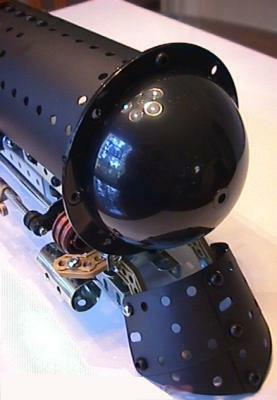 In the photos below, the gold and copper colored parts are plastic, while many of the black ones and all bright parts are metal. Most of the black "plates", both rectangular and triangular in shape, are made from a flexible material (I can't say exactly what). 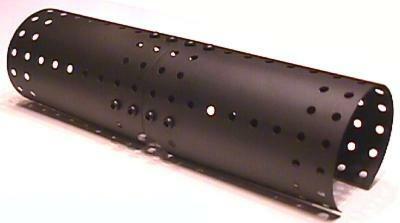 The nose of the train (which functions almost as a modern counterpart to the old Gilbert boiler top) is made of shiny black plastic. The boiler itself is metal, as are all of the frame components and all screws, nuts, axle shafts, etc. 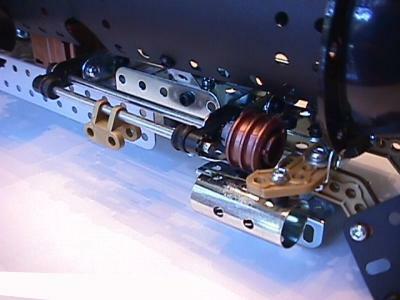 The motor housing is plastic, as are the two gears that come with the set. 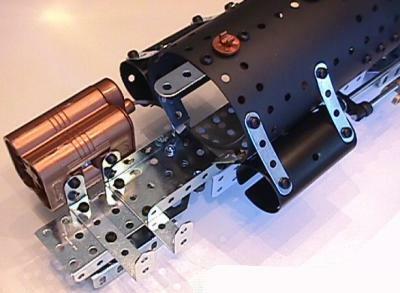 In the group of photos below, the first photo shows the completed frame with motor and battery box mounted. Photo 2 shows the front (leading) truck assembly which is free to rotate on its pivot (as illustrated) to allow the locomotive to negotiate curves. The trailing truck at the rear of the locomotive (beneath the cab) moves in exactly the same manner, only in reverse. The boiler (photo 3) is assembled from two identical boiler halves, as shown. 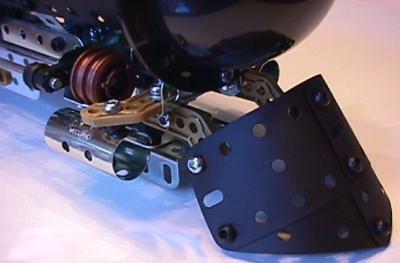 Note that these two parts do not form a closed tube when assembled; a gap along the bottom allows the boiler sides to fit over the motor and down onto the frame. In the next group of photos, the boiler has been mounted onto the frame. The cowcatcher, assembled from four of the flexible plates mentioned above, is mounted onto the front of the frame. Photo 2 shows the rear of the frame with the battery case attached; this is where the cab will be mounted. The final three photos in this group show details of the front end of the locomotive up to this point. The next phase of construction involves assembling and mounting the cab to the frame/boiler assembly. The first photo shows the assembled cab structure. Like the cowcatcher, it utilizes a number of flexible plates. The second and third photos show the cab attached to the rear of the boiler/frame assembly; note that while the roof of the cab is still horizontal, the flexible cab sides have been pulled down into a vertical position, with the plates connecting the roof to the sides now forming a smooth curve. NOTE: an advantage of the flexible panels used in this set over metal panels is that they will NOT remain deformed after the model is disassembled, but will want to spring back into their regular flat configuration. With a little help, they can easily be made to do so. Finally, with the cab in place the wheels, connecting rods, and remaining drive gear and components are installed. The final results are shown in the photos below. For scale, I have shown the new Erector Hudson model posing with a First Gear Erector Truck. The final two photos show the two other train models that can be built with the Special Edition Train Set, plus some of the additional model designs.